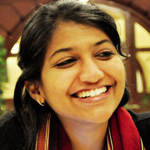 Agarawal, Megha, is a designer turned social-entrepreneur, founder of the organization – ‘Crafting Nuru’. She has a Fine Art background and did her Masters in Design – Visual Communication from IDC IIT Bombay. Her comfortable corporate career was short lived soon after she founded Crafting Nuru with the support of IIM Ahmedabad and started working with the institute as Research Associate on Craft research projects. Crafting Nuru (www.craftingnuru.com) presently provides craft-design-education consultancy to NGOs and other craft based organizations; as well as is involved in production of handicraft products in Rajasthan. The organization aims to start a chain reaction with Craft-education being instrumental in over-all development of craft-sector and in turn, sustainable development of India. Their ‘design curriculum for artisans’ had been implemented in five artisan-schools in Bikaner by Rangsutra and the schools’ success validates the vision set by Crafting Nuru. Apart from being a designer, she is an artist proficient in Hindustani classical music, had worked as radio jockey, has keen interest in documentary film making and writing.